JVNotify-Pro is beneficial for practically all partners in the online money making business. Product developers looking for affiliate marketers to sell their products, Marketers looking for great products to sell to their customers and followers, product buyers just looking for a great product to use and add to their everyday needs. Not only is JVN-P a market place for members to connect and discuss new joint venture product launches, it also a platform where new affiliates can learn how to effectively get into the industry and become successful marketers. The top marketers in all fields are displayed to help inspire and encourage others. The forum is filled with experienced marketers who are willing to lend a hand when you need it. Support is provided in the help or support section and you just need to submit a ticket and a member of the support team will contact you. In the forum, marketers experienced or not, are willing to lend a hand when you need it. 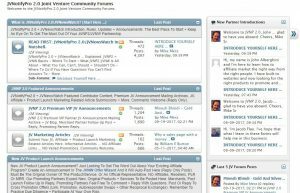 The forum is packed with information to guide affiliate markets with topics like, ways to connect with internet marketing authorities, tips for better sales copies, email marketing tips and many more. Just click on the threads, read and ask and someone will help you. You can sign up for free and use the platform as a free member as long as you want or you can pay $47 monthly and get the VIP Benefits. The free version allows performing basic activities while the VIP membership operations help boost your revenue earning potential. I am a free member and enjoying what JVNotify has to offer for me but by subscribing to the VIP plan you will gain an advantage over the free member and as a VIP your article or review of a product may appear on the JVNotify home page allowing you to gain traffic and sales as a feature page. You can even promote JVN-P as an affiliate product. You can sign up for free and if you feel being a VIP is better, you can pay for your membership with your affiliate earning. Click below to check it out. The website platform provided by Mike Merz is a fantastic concept; bring together like-minded people with the same focus for all. The many affiliate programs available for the marketers to promote just keep growing. You can participate in an original launch of products developed by the owners or there are many already launched products that you can review and rate to increase you traffic and sales to your own site. That’s why I have given JVNotify a 9/10. You’ll Be In Good Company (I’m A JVNP Partner, Too!). Join the market place where the top affiliate marketers hang out and get into your first big ticket JOINT VENTURE NOW. Feel free to leave a comment and happy affiliate marketing. This seems like a very good community to get involved in. There are so many ways this could benefit anyone as an affiliate marketer. I am definitely interested in seeing what they are more about. I have one question for you, Can you elaborate more on the VIP membership? What are the benefits? Hi Jeff, sure is a great place to be a part of. Just to let you know JVNP emails to you new launches to be apart of if you so choose. With the VIP membership here are some of the benefits that you get…VIP Premium Content Area (incldes VIP brains storming and integration), Audio & Video Premium Content Training, Complimentary Product Review Accounts, Your Hoplink may be randomly selected to appear on the JVNP home page which can allow earning commissions…These are some extras and to get more info click on the links and check them out. Even just to sign up for free it is worth it. thanks for the review. I had not heard of JVNotify before and am glad to know about it. There are a ton of similar sites, but from your review it seems that’s what is different about this one is the number of successful marketers hang out. I think all the similar sites can claim that also, but it seems this one may have an active community that sets it apart from the others. Hi and thanks for your comments. I have found JVNotify as a great source to find top quality affiliate programs to promote and with big names behind them to really give the confidence and support to give a greater chance of success. I am glad I was able to point you in the right direction. I’m sure you will see the benefits once you look around as I have. I have been looking to join this community for a while now. But I couldn’t find a well written review on it until now. I want to thank you for this first and foremost. I will say that ever since I became a member of the Jvnotify community I have to say that everything you say here is true and I haven’t noticed any negative aspects of it. I will be sure to share this review on Facebook.